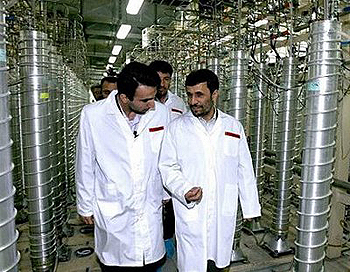 Iranian President Mahmoud Ahmadinejad inspects the Natanz nuclear plant in central Iran. Iranian Defense Minister Ahmad Vahidi said in an interview on Australian television last Sunday, "At the heart of sanctions, war planes are produced." These comments underline the inadequacy of current measures on nuclear non-proliferation. In all regions of the world, especially the Middle East, the quest for nuclear energy and defense has yet to be resolved. The U.N. resolutions of sanctions and military reprisals haven't prevented states seeking greater defense systems or nuclear technology. Rising natural disasters and the need for greater energy sources drive states to seek nuclear energy. At the same time, globalization has facilitated the industry of defense. Taken together, the development of nuclear weapons by any state is plausible. Collusion between Iran and Sudan on nuclear energy, for instance, doesn't preclude trade in defense systems. Similar collusion can be seen between Russia and Iran, and of course within the massive Israeli and American defense industries. The extensive nature of international trade in defense today could well encourage states to produce nuclear weapons. Has state security become a relative concern of resource management, transcending state borders? If so, how can collective security evolve without regional accord on all resources? Do crises arise from a lack of systemic regulation, on both defense industry and nuclear energy? And if that's the case, would realizing geopolitical energy efficiencies of nuclear energy require across-the-board regulation on defense industries? These questions pervade the geopolitical framework of security in the Middle East and ASEAN regions. "Security doesn't benefit via nuclear weapons," U.S. Assistant Secretary of State Andrew Shapiro said last week in reference to Iran. Whose security? This comment does not reflect a systemic determination of state security. They neither substantiate the international validity of nuclear non-proliferation, nor do they infer any relative security of a global nuclear "umbrella." Underpinning them could be the U.S. resistance to regional consistency on nuclear non-proliferation, especially in the Middle East. According to Jay Solomon of The Wall Street Journal, the U.S. State Department will take a different approach region by region and country by country, when it comes to enriching uranium and sharing nuclear fuel and technology. Asia, for instance, doesn't factor as the same threat as Middle Eastern nuclear proliferation. Nevertheless, two key areas posing similar threats within both regions stand out: Israeli nuclear defense in the Middle East and North Korea's in Asia. Both Israeli and North Korean discord with states of their respective regions, and their nuclear capabilities present trans-regional security threats. Take Asia. If America sets a different standard for Hanoi on uranium, what sort of message is this sending states currently violating nuclear treaties? Regional accord could be vital for resolving the international inadequacies of nuclear regulation. When it comes to selling nuclear fuel to Vietnam, however, America sees no reason to consult China. Yet China holds the key for collective security, pollution reduction and progressive energy efficiencies in this region. The fundamentals are already in place: China already acknowledges the right of every country to have nuclear fuel for peaceful purposes. Nevertheless, the Korean Peninsula remains bedevilled with bilateral discord and North Korean nuclear technology. North Korea's defense industry is out of hand, its energy needs at critical levels. The six-party talks are failing. Forming systemic measures on efficient energy practices is a way forward. The geopolitical reduction of carbon levels, after all, is an all-inclusive process of political progression. More to the point, the process structures regional consistency on nuclear technology. Likewise with Iran. How are "peaceful purposes" of nuclear technology verified without systemic measures on energy efficiencies and defense industry? The regional framework is vital. It streamlines international accord and fills the political void by which international regulations fall short. Theocratic Israel, for example, stands as a beacon of non-compliance in the Middle East, to U.N. resolutions, nuclear treaties and defense regulation, especially for theocratic Iran. Iran would rather comply with the Non-Aligned Movement and the Nuclear Achievement Bill rather than U.N. resolutions on nuclear technology. Further complicating the regional discord could be America's uranium agreement with the United Arab Emirates. "We believe the U.A.E. agreement ... is a model for the region." said a U.S. official, which entails purchasing nuclear fuel from the "international market." Is a nuclear agreement based on market forces to be a watershed in international relations? As Greg Sheridan noted in the Week-End Australian recently, the political security realm has a different interchange than the trade/commerce one. Either way, the strategic rationale of the former, still factors through market forces via defense industry. Laurelle Atkinsson is a geopolitical analyst in Australia.